Before :- S.B. Sinha & Harjit Singh Bedi, JJ. For the Appellant :- S. Balakrishnan, Senior Advocate (AC) and Krishna Janardhan Bhat, In-person. For the Respondent :- S.N. Bhat, N.P.S. Pawar and D.P. Chaturvedi, Advocates. IMPORTANT Dishonour of cheque of Rs. 1.50 lakhs - Complainant could not prove that he had this much money to advance - Accused acquitted. IMPORTANT Presumption of innocence is a human right. IMPORTANT Dishonour of cheque - Section 139 of Negotiable Instrument Act raises a presumption in favour of holder of cheque that same had been issued to him for discharge of debt or liability - It does not raise a presumption that debt was legally recoverable. (1) Ordinarily in terms of Section 269SS of the Income Tax Act, any advance taken by way of any loan of more than Rs. 20,000/- was to be made by way of an account payee cheque only. (2) Presumption of innocence is a human right. Accused was running business in partnership. Accused gave four blank cheques duly signed to his partner for speedy payments in connection with business transactions - Thereafter their relations became strained and they parted their ways. The partner gave the cheque to his near relation (Complainant) who filled the amount of Rs. 1.50 lakhs and presented the cheque to Bank. The cheque was dishonoured. Complainant filed petition under Section 138 - Complainant could show that he the money to advance nor any documentary proof - Conviction set aside. B. Negotiable Instruments Act, 1881, Sections 139 and 138 - Scope of presumption under Section 139 - Section 139 raises no presumption in regard to existence of debt - Existence of legally recoverable debt is not a matter of presumption under Section 139 of the Act - It merely raises a presumption in favour of a holder of the cheque that the same has been issued for discharge of any debt or other liability. (3) That the cheque so issued had been returned due to insufficiency of funds. D. Evidence Act - Presumption - A statutory presumption has an evidentiary value - The question as to whether the presumption whether stood rebutted or not, must, therefore, be determined keeping in view the other evidences on record - For the said purpose, stepping into the witness box by the appellant is not imperative. An accused for discharging the burden of proof placed upon him under a statute need not examine himself. He may discharge his burden on the basis of the materials already brought on records. An accused has a constitution right to maintain silence. Standard of proof on the part of an accused and that of the prosecution in a criminal case is different. F. Evidence Act, Sections 101, 102 and 103 - Criminal trial - Onus to prove - Prosecution must prove the guilt of an accused beyond all reasonable doubt, th standard of proof so as to prove a defence on the part of an accused is 'preponderance of probabilities' - Inference of preponderance of probabilities can be drawn not only from the materials brought on records by the parties but also by reference to the circumstances upon which he relies. G. Evidence Act, Sections 3 and 4 - Evidence Act, Sections 101, 102 and 103 - Onus - Proof of fact - Proving of negative is difficult, but it cannot be suggested that a negative can never be proved but there are cases where such difficulties are faced by the accused e.g. honest and reasonable mistake of fact. H. Negotiable Instruments Act, 1881, Section 138 - Object of provision of Section 138 - Provision of Section 138 has been inserted to regulate the growing business, trade, commerce and industrial activities of the country and the strict liability to promote greater vigilance in financial matters and to safeguard the faith of the creditor in the drawer of the cheque which is essential to the economic life of a developing country like India. I. Negotiable Instruments Act, 1881, Sections 139 and 138 - Rebuttal of presumption - Presumption of innocence is a human right - Statute mandates raising of presumption but it stops at that - It does not say how presumption drawn should be held to have rebutted - Other important principles of legal jurisprudence, namely presumption of innocence as human rights and the doctrine of reverse burden introduced by Section 139 should be delicately balanced - Such balancing acts, indisputably would largely depend upon the factual matrix of each case. S.B. Sinha, J. - Appellant and one R.G. Bhat were jointly running a business in the name and style of Vinaya Enterprises at Hubli together. Appellant executed a Power of Attorney in his favour. 2. Allegedly, he had handed over four blank cheques to the said constituted attorney for meeting the expenses of the business. The counter foil of the cheque books was also allegedly filled in by Shri R.G. Bhat. 3-4. The cheque bearing No. 044483 was shown to have been a self drawn one for a sum of Rs. 1500/-. "My client Sh. Krishna Janardhana Bhat, Proprietor of Vinaya Enterprises, Tarihal Hubli has given authority to give notice as follows. My client appointed Shri Raghavendra Ganapati Bhat as his power of Attorney Holder on 21.8.1993 to run Vinay Enterprises as agent. He has started misusing the terms and conditions of the Power of Attorney. Hence my client cancelled the Power of Attorney on 21.8.96 by giving notice. If at all anybody deals with him on the Power of Attorney my client is not responsible in future." 5. On the premise that the respondent advanced a sum of Rs. 1,50,000/- to the appellant on 14.6.1998 and the latter on his own went to his house on 20.7.1998 to return the loan by an account payee cheque which having been dishonoured when presented; a complaint petition was filed. "Your client D.G. Hegde Goddalamane is husband of sister of my power of attorney holder R.G. Bhat (Proprietor Prasad Enterprises Tarihal Industrial Estate) of Hubli. I do not have any dealing with him as alleged in your letter. Knowing that the power of attorney holder R.G. Bhat has lost faith and having acted illegally and in anticipation of his committing further illegal acts I have legally cancelled my power of attorney and published the notice in a famous Kannada daily "Samyukta Karnataka" on 3.10.96. From that date I do not have any relation with him or any of his relatives including your client. Please verify the handwriting and signature on the cheque and advice your client not to do such (illegalities) colluding with his brother-in-law." 7. The learned Trial Judge convicted the appellant and sentenced him to undergo imprisonment for six months and further directed payment of compensation for a sum of Rs. 1,50,000/-. An appeal preferred thereagainst was dismissed by the Sessions Judge by a judgment and order dated 28.7.2004. 8. The High Court in exercise of its revisional jurisdiction, however, on a revision petition filed by the appellant, partly allowed the same by reducing the substantive sentence to one week. 9. The Special Leave Petition was filed by the appellant in person. As it was noticed by a Bench of this Court that some question of law arises for its consideration, Mr. S. Balakrishnan, learned senior counsel was requested to assist the Court. 10. Mr. Balakrishnan urged that the learned Trial Judge, the Sessions Court as also the High Court committed a serious illegality insofar as it misread and misapplied the provisions of Section 139 of the Negotiable Instruments Act (for short "the Act"). (i) There is a legally enforceable debt. (ii) The drawer of the cheque issued the cheque to satisfy part or whole of the debt. (iii) The cheque so issued has been returned due to insufficiency of funds. It was urged that only ingredient No. 2 is a subject matter of presumption under Section 139 of the Act and not the first one. It was argued that except the word of mouth of the complainant nothing has been brought on record to prove the offence as against the appellant. 11. Mr. S.N. Bhat, learned counsel appearing on behalf of the respondent, on the other hand, submitted that the appellant has rightly been found guilty of commission of an offence under Section 138 of the Act as bouncing of the cheque issued by him carries a mandatory presumption in terms of Section 139 read with Section 118 (a) of the Act. It was urged that it is not believable that the appellant despite referring the dispute to the Panchayat and issuing a paper publication on 3.10.1996 would not insist on taking back the cheque book from his erstwhile constituted attorney or would not inform the bank thereabout. Moreover, he having come out with a positive defence, it was for him to prove the same. 12. Before we embark upon the factual issue involved herein, we would notice the manner in which the court proceeded to determine the case. "(1) Whether the complainant proves the hilt that the accused to discharge earlier debt of Rs. 1,50,000/-, has got issued a cheque on 20.7.1998 for Rs. 1,50,000/- drawn at Vijay Bank, Tarahal Branch, Hubli ? (2) If so, whether the said cheque came to be dishonoured as "funds insufficient" after its presentation and despite of issuance of notice, the accused did not pay the due amount within stipulated time without any cause, thereby Negotiable Instruments Act ?" "Considering the proposition of law, in the present case also the accused admitted the signature on Ex.P.1. But, the contention is that his P.A. Holder mis-utilized his signed blank cheques through his relative complainant and the fact of the present case and fact of the decision mentioned by me are similar one and the observation made by the Hon'ble High Court in the above decision and principle laid down therein are clearly applicable to the case in hand. Therefore, the defence taken by the accused herein without stepping into the witness-box, is not acceptable one and there is no cogent evidence produced by the accused to prove his special reasons for issuance of the cheque in question." "Here, the accused has not produced any evidence to discard the testimony of PW-1. Therefore, the presumption is to be drawn in favour of the holder of the cheque, who has received it for discharge of liability in view of the decision of the Hon'ble Supreme Court." "There is issued (sic) that the amount is payable and no criminal court is required to embark upon any enquiry that goes behind the Act of issuance of the cheque. If the drawer contends that there were certain special reasons whereby a cheque was issued and that the cheque was not intended to be encashed or honoured, the onus of establishing this shifts squarely to the accused." 15. The complainant's case was, thus, primarily accepted for the reason that the appellant did not step into the witness box. 16. The appellate court took an identical stand. It proceeded on the premise that the statement of accused under Section 313 of the Code of Criminal Procedure regarding misuse of blank cheque by the complainant and filling up Rs. 1,50,000/- instead of Rs. 1500/- is contradictory to his own admission in the reply to the notice issued to him. "Now as far as the financial ability of the complainant to issue cheque for such huge amount to the accused is not a matter to be considered by the trial court or by me also since issue of Ex.P.1 and its dishonour is proved by the complainant beyond reasonable doubt." "Since the burden of proving that the cheque had been misused is on the accused-petitioner, and there being a concurrent finding of the Trial Court and the Appellant Court with regard to that holding that the petitioner had failed to discharge that burden, I do not find any ground to interfere in the order of the Trial Court and that the Appellate Court, so far as they hold the petitioner guilty of an offence punishable under Section 138 of the Negotiable Instruments Act." 18. Before embarking upon the legal issues, we may analyse the deposition of PW-1 - Complainant. He was a resident of village Goddalmane. Appellant is a resident of village Kekkar. As he was running an industry at Hubli, he sometimes resided in Hubli also. They were said to be friends. He asked him to give a loan of Rs. 1.5 lakhs in the first week of June, 1998 and the amount was handed over to him on 14th June, 1998. It was allegedly agreed that on the appellant's failure to repay the said loan within one month, 15% interest would be charged. No document was executed; no pronote was executed; no receipt was obtained. Appellant is said to have come to his house suo moto on 20.07.1998 and handed over the cheque which was sent to Varada Grameen Bank for collection whereupon notice had been issued. Despite the fact that he was aware that a dispute had been raised in regard to the writings in the cheque, the same was not proved. Merely, the cheque was tendered and it was marked as an exhibit. The cheque appears to have been issued as a proprietor of a business concern. Despite the fact that R.G. Bhat was his brother-in-law, he denied that he was running the said business. He also feigned his ignorance as to whether the said industry was being run by R.G. Bhat on the basis of the Power of Attorney executed by the appellant. He, however, accepted that they had been running it together. He also accepted the relationship between him and R.G. Bhat. He knew about the dispute. He accepted that a panchayat meeting was held in regard thereto. Surprisingly, he denied his knowledge in regard to the existence of the power of attorney stating that the same was not made in his presence. He admitted that he was present on 2.10.1996 in the panchayat meeting to resolve the problem arising out of the dispute between R.G. Bhat and the appellant. He accepted that wooden and steel materials were placed in Vinay Enterprises and R.G. Bhat had been running the same type of industry in Tarihal Industrial Estate. According to him, he had been running such an industry in the name of Prasad Enterprises even prior to 1996. His acquaintance, according to him, with the appellant was only through his brother-in-law. He did not say that he had friendship with the appellant. There also does not appear to be any business transactions between them. He could not state about the denomination of the notes although according to him he had drawn the amount from the society. He did not produce any books of accounts or any other proof to show that he got so much money from the bank. He admittedly did not have any written document pertaining to the accused. He accepted that there was no witness to the transaction. He, of course, denied certain suggestions, but the suggestions put to him were required to be considered by the court below in the backdrop of the facts and circumstances of the case. 19. The courts below failed to notice that ordinarily in terms of Section 269SS of the Income Tax Act, any advance taken by way of any loan of more than Rs. 20,000/- was to be made by way of an account payee cheque only. "271D. Penalty for failure to comply with the provisions of section 269SS. - (1) If a person takes or accepts any loan or deposit in contravention of the provisions of section 269SS, he shall be liable to pay, by way of penalty, a sum equal to the amount of the loan or deposit so taken or accepted. (2) Any penalty imposable under sub-section (1) shall be imposed by the Joint Commissioner." 20. Indisputably, a mandatory presumption is required to be raised in terms of Section 118(b) and Section 139 of the Act. Section 13(1) of the Act defines 'negotiable instrument' to mean "a promissory note, bill of exchange or cheque payable either to order or to bearer". (iii) that the cheque so issued had been returned due to insufficiency of funds. 21. The proviso appended to the said section provides for compliance of legal requirements before a complaint petition can be acted upon by a court of law. Section 139 of the Act merely raises a presumption in regard to the second aspect of the matter. Existence of legally recoverable debt is not a matter of presumption under Section 139 of the Act. It merely raises a presumption in favour of a holder of the cheque that the same has been issued for discharge of any debt or other liability. 22. The courts below, as noticed hereinbefore, proceeded on the basis that Section 139 raises a presumption in regard to existence of a debt also. The courts below, in our opinion, committed a serious error in proceeding on the basis that for proving the defence the accused is required to step into the witness box and unless he does so he would not be discharging his burden. Such an approach on the part of the courts, we feel, is not correct. 23. An accused for discharging the burden of proof placed upon him under a statute need not examine himself. He may discharge his burden on the basis of the materials already brought on records. An accused has a constitutional right to maintain silence. Standard of proof on the part of an accused and that of the prosecution in a criminal case is different. 25. Furthermore, whereas prosecution must prove the guilt of an accused beyond all reasonable doubt, the standard of proof so as to prove a defence on the part of an accused is 'preponderance of probabilities'. Inference of preponderance of probabilities can be drawn not only from the materials brought on records by the parties but also by reference to the circumstances upon which he relies. 26. A statutory presumption has an evidentiary value. The question as to whether the presumption whether stood rebutted or not, must, therefore, be determined keeping in view the other evidences on record. For the said purpose, stepping into the witness box by the appellant is not imperative. In a case of this nature, where the chances of false implication cannot be ruled out, the background fact and the conduct of the parties together with their legal requirements are required to be taken into consideration. 27. In M.S. Narayana Menon Alias Mani v. State of Kerala and Another, 2006(3) RCR(Criminal) 504 : 2006(2) Apex Criminal 531 : [(2006)6 SCC 39], it was held that once the accused is found to discharge his initial burden, it shifts to the complainant. 28. Four cheques, according to the accused, appear to have been drawn on the same day. The counterfoil of the cheque book, according to the appellant, was in the handwriting of R.G. Bhat wherein it was shown that apart from other payments, a sum of Rs. 1500/- was withdrawn on a self-drawn cheque. The courts below proceeded to hold that the defence raised by the appellant has not been proved, which, in our opinion, is not correct. He did not know that the said cheque had not been encashed. He replied to the notice thinking that one of the cheque has been misused. There is nothing on record to show that he knew that one of the cheques was still with R.G. Bhat. 29. Disputes and differences between him and R.G. Bhat stood established by admission of the respondent himself. Similar industry was being run by R.G. 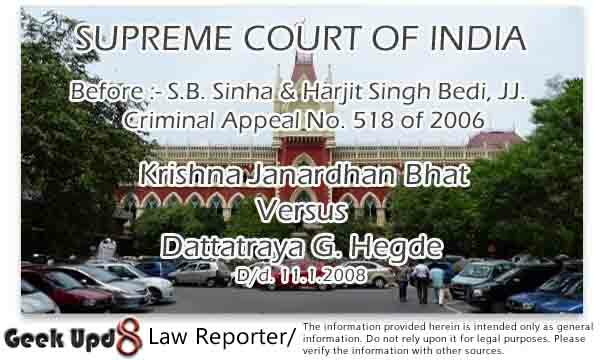 Bhat although he was acting as the constituted attorney of the appellant. According to the appellant, R.G. Bhat had cheated him. The counterfoil showed that not more than Rs. 20,000/- had ever been withdrawn from that bank at a time. The courts were required to draw an inference as to the probability of the complainant's advancing a sum of Rs. 1.5 lakhs on mere asking and that too without keeping any documentary proof. Even there was no witness. The purported story that the appellant would himself come forward to return the amount by a cheque knowing fully well that he did not have any sufficient funds is difficult to believe. "12. The Act raises two presumptions; firstly, in regard to the passing of consideration as contained in Section 118 (a) therein and, secondly, a presumption that the holder of cheque receiving the same of the nature referred to in Section 139 discharged in whole or in part any debt or other liability. Presumptions both under Sections 118 (a) and 139 are rebuttable in nature. Having regard to the definition of terms 'proved' and 'disproved' as contained in Section 3 of the Evidence Act as also the nature of the said burden upon the prosecution vis-a-vis an accused it is not necessary that the accused must step into the witness box to discharge the burden of proof in terms of the aforementioned provision. 13. It is furthermore not in doubt or dispute that whereas the standard of proof so far as the prosekution is concerned is proof of guilt beyond all reasonable doubt; the one on the accused is only mere preponderance of probability." "10 ....The High Court was entitled to take notice of the conduct of the parties. It has been found by the High Court as of fact that the complainant did not approach the court with clean hands. His conduct was not that of a prudent man. Why no instrument was executed although a huge sum of money was allegedly paid to the respondent was a relevant question which could be posed in the matter. It was open to the High Court to draw its own conclusion therein. Not only no document had been executed, even no interest had been charged. It would be absurd to form an opinion that despite knowing that the respondent even was not in a position to discharge his burden to pay instalments in respect of the prized amount, an advance would be made to him and that too even after institution of three civil suits. The amount advanced even did not carry any interest. If in a situation of this nature, the High Court has arrived at a finding that the respondent has discharged his burden of proof cast on him under Section 139 of the Act, no exception thereto can be taken." "22.... "Presumptions are rules of evidence and do not conflict with the presumption of innocence, because by the latter, all that is meant is that the prosecution is obliged to prove the case against the accused beyond reasonable doubt. The obligation on the prosecution may be discharged with the help of presumptions of law or fact unless the accused adduces evidence showing the reasonable possibility of the non-existence of the presumed fact. 23. In other words, provided the facts required to form the basis of a presumption of law exist, no discretion is left with the court but to draw the statutory conclusion, but this does not preclude the person against whom the presumption is drawn from rebutting it and proving the contrary. A fact is said to be proved when, "after considering the matters before it, the court either believes it to exist, or considers its existence so probable that a prudent man ought, under the circumstances of the particular case, to act upon the supposition that it exists". Therefore, the rebuttal does not have to be conclusively established but such evidence must be adduced before the court in support of the defence that the court must either believe the defence to exist or consider its existence to be reasonably probable, the standard of reasonability being that of the "prudent man"." 32. We assume that the law laid down therein is correct. The views we have taken are not inconsistent therewith. 33. But, we may at the same time notice the development of law in this area in some jurisdictions. "In determining whether a reverse burden is compatible with the presumption of innocence regard should also be had to the pragmatics of proof. How difficult would it be for the prosecution to prove guilt without the reverse burden ? How easily could an innocent defendant discharge the reverse burden ? But courts will not allow these pragmatic considerations to override the legitimate rights of the defendant. Pragmatism will have greater sway where the reverse burden would not pose the risk of great injustice - where the offence is not too serious or the reverse burden only concerns a matter incidental to guilt. And greater weight will be given to prosecutorial efficiency in the regulatory environment." 34. We are not oblivious of the fact that the said provision has been inserted to regulate the growing business, trade, commerce and industrial activities of the country and the strict liability to promote greater vigilance in financial matters and to safeguard the faith of the creditor in the drawer of the cheque which is essential to the economic life of a developing country like India. This, however, shall not mean that the courts shall put a blind eye to the ground realities. Statute mandates raising of presumption but it stops at that. It does not say how presumption drawn should be held to have rebutted. Other important principles of legal jurisprudence, namely presumption of innocence as human rights and the doctrine of reverse burden introduced by Section 139 should be delicately balanced. Such balancing acts, indisputably would largely depend upon the factual matrix of each case, the materials brought on record and having regard to legal principles governing the same. 35. Keeping in view the peculiar facts and circumstances of this case, we are of the opinion that the courts below approached the case from a wholly wrong angle, viz., wrong application of the legal principles in the fact situation of the case. In view of the legal position as has been enunciated by this Court in M.S. Narayana Menon (supra) and later cases, we are of the opinion that the High Court should have entertained the revision application. 36. For the reasons aforementioned, the appeal is allowed. The judgments of conviction and sentence passed against the appellant are set aside.